Tonight at 10pm ET on the Food Network is a special holiday edition of Chopped that features the co-hosts of The Kitchen competing against each other for charity. Geoffrey Zakarian was left out of the mix leaving Sunny Anderson, Jeff Mauro, Marcela Valladolid, and Katie Lee competing to win $10,000 for their charity of choice. "We're decking the Chopped halls with the stars of Food Network's The Kitchen! In the first round, the talented co-hosts must make merry appetizers out of seafood salad and challah bread. Then in the entree round, meat and potatoes seem like a great gimme, but what will the star cooks do to bring yule logs to the holiday party? And the two finalists' demeanors become fast and focused as they try to win a $10,000 holiday gift for a favorite charity." Perhaps Geoffrey Zakarian was left out due to him being an Iron Chef with a skill advantage as well as him being a frequent judge on Chopped. The episode was filmed all the way back in June, but it just airing now due to the holiday theme. 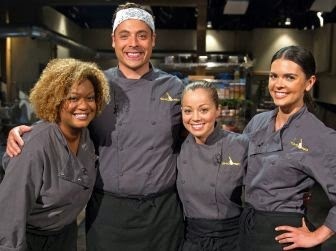 Jeff, Sunny, and Marcela have all competed on Chopped before, so Katie Lee is probably at a disadvantage from the start. Who do you think wins it tonight? Jeff has competed on Chopped more than once and still hasn't gotten it right. Jeff: "OK I made a seafood salad sandwich on Challah bread." I was surprised he made it to the second round. I already saw it, so I know who wins. That was fun to watch. I called who was going to win this before it even aired. Katie Lee has no business being on any cooking show. Her only claim to fame was being married to Billy Joel. Many other people have wondered why she is on The Kitchen, so FN had her win on Chopped to justify it. Poor Marcella looked liked she wanted to be anywhere but that show! No wonder...I would be mad too knowing they already had the winner picked! I think I would like a short season of six to eight episodes of just charity kitchens getting fixed up. A good break from delusional restaurant owners with family problems looking for a renovation. I'd also like it if FN would stop churning out so many episodes of the show. It's bad in immediate cash terms for Irvine's crew, but I'd enjoy the episodes that do air more. Katie Lee had a food blog when she was in college and has contributed recipes to Parade magazine, so she does have some—minimal—food cred. However, I don't believe she's had formal culinary training, and I find her irritating to listen to. It's no wonder she wasn't asked back for the second season of Top Chef. I seem to be in the minority. I really like Katie Lee. I'm done with foodnetwork, it's starting to become a joke. I agree. I love watching these people together and like The Kitchen ever so much more than The Chew, which has gotten just plain silly and game showish. I like her, too...she's great friends with Bobby Flay, BUT I agree w/ MoHub about her voice...nails on a chalkboard.